If your car breaks down, just give us a call! 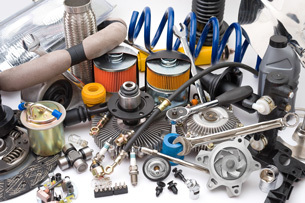 C & T Auto Repair Inc. is a full-service automotive repair shop. We can offer repairs and maintenance on most foreign and domestic vehicles. We give full, detailed estimates to our customers before any work is performed. C&T was great. My schedule conflicted with the times they were open and they were able to answer my questions over the phone and I dropped my car off at night. They were able to service the car and talk to me on the phone with the options. I searched afterwards and everything they told me was legit, there explanations were easy to understand, and the prices for parts were not inflated. In addition to the repair I had the oil changed. A friendly bonus was changing the headlight bulb because I called and asked what the charge would be and since it was out they replaced it at no charge! I was impressed that they even kept my old spark plugs to show me the corrosion and build-up. It's a great place that seems to be family run and operated! Towed my car at no expense. Charged me less than half what another place was charging for the same repair. Tony was very friendly and helpful, although the turnaround time was fairly slow. To be fair, my repair was fairly involved (timing chain replacement). I didn't need the car, either, so I wasn't calling very much. Good service. I would definitely reccommend them to a friend. These guys are great. they give you fair prices - naming an actual price for the job rather than telling you it's going to take 3-4 hours. they are fast too. Whether it's a big job or a little job, or you're dealing with them the first time or the fifth time, they are courteous. Best auto shop in cleveland! I have been to many places that take advantage of me because I'm a girl and this place is NOT one of those. They are upfront and honest. no problems in two visits for minor work. nice guys. fair prices. C & T is the best auto repairing shop I ever had. People there are very honest. They explained everything for my repairs. The price was reasonable, and the job completed was of top quality. Their mechanics are really good. I would recommend C & T to anyone who looks for a reliable auto shop in the city. C & T are honest, fair and fast. you can't ask for much more than that when it comes to a mechanic. I have been dealing with C and T for over 20 years. They have always been professional, accurate and on time with their repairs. I would recommend them to everyone. These guy are honest, fair, reasonably priced, helpful and fast. You can't really diagnose a problem over the telephone; I know, I'm in the repair business myself.